Photo by Photo by Jeff Kubina. The distinct geography of every part of the Earth provides each local community with its own set of renewable energy options to harness: some places get ample solar input, others wind, hydro, or geothermal power. Yet renewable energy, like the capricious weather, is variable and cannot always promise a constant supply of energy. Any electricity generated must be used as it is made. In other words, technology to store it is still lacking. Hence, when a thick cloud blocks the sun, solar power generation is halted for as long as the cloud is there. This is where hydrogen (H2) enters the renewable energy equation; not just as a possible technology of the future, but as a breakthrough technology now in action, in Brisbane, Australia. In fact, fuel cell technology has been used as far back as 1839 and as Jules Verne wrote in The Mysterious Island in 1874, “Water will be the coal of the future.” More recently, NASA has relied upon hydrogen for its missions and other activities. Introduced as a “simple solution” by American biochemical engineer, Patrick Kenji Takahashi, hydrogen is the simplest element on the periodic table and the most abundant in the universe. It is always found combined with other elements and must be separated from hydrocarbons (e.g., methane CH4) or water (H2O) for use as an energy carrier. 1 – When energy is generated from renewable sources like solar, wind and geothermal, electricity is consumed as it is produced. However, when electricity supply is greater than demand, this surplus current is passed through water (H2O), which causes it to split into hydrogen (H) and oxygen (O) through a process called electrolysis. This process can be done either through the grid or on-site. 2 – Separated hydrogen is then stored in a pressurized tank for future use. 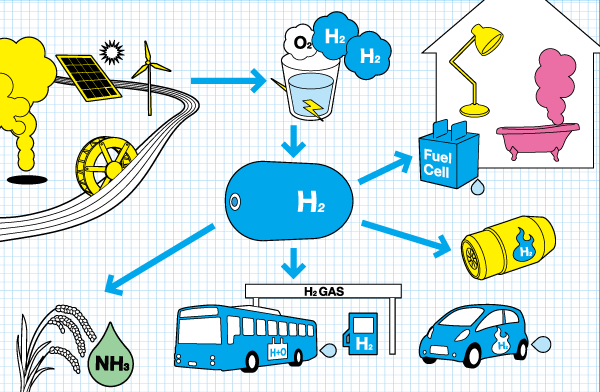 3 – The stored hydrogen is then sent to fuel cells where it is recombined with oxygen to power houses or fuel vehicles. Releasing by-products of heat and water, hydrogen can also be utilized for heating or even drinking water. A key advantage of hydrogen is that the energy loss in times of excess supply is minimised through the storing of the excess energy otherwise left unused. Hydrogen also shows more potential compared to a storage battery since the fuel cell is built out of hardly any rare metals that cause competition among countries and runs for a longer life span. 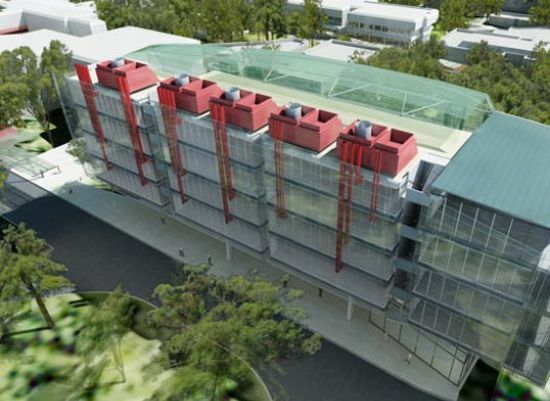 Natural energy sources from the sun and water is the energy of choice for the landmark Sir Samuel Griffith Center planned for Nathan Campus of Griffith University in Brisbane, Australia. The building, construction of which is to begin mid-2011 and be completed in 2013, has been designed to be off-grid and energy independent. It is the world’s first solar powered hydrogen education and research building, showcasing a clear message of sustainability. Sir Samuel Griffith Building. Image by Griffith University. 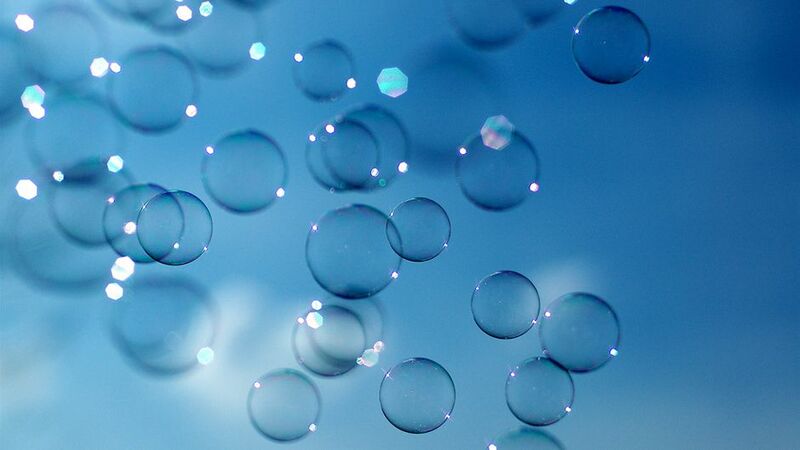 “Hydrogen is potentially limitless,” explains Deputy Vice Chancellor (Research) Professor Ned Pankhurst of Griffith University. The six-story facility is being made from 30% recycled materials such as recycled steel, rubber, timber, and crushed demolition concrete. It also features a solar powered hydrogen production and energy management system accompanied by on-site grey water recycling, advanced water collection, a green roof, and natural ventilation. The building, designed by COX Rayner architects, will pull energy from the sun with solar cells on the roof and solar film on the windows for greater radiation capture. Most (85%) of the generated solar power will be used during the day and the remaining 15% will be used to produce renewable hydrogen through electrolysis (as per step 2 above). Stored hydrogen is later used as needed for powering a fuel cell to generate electricity in times when the sun is not out. 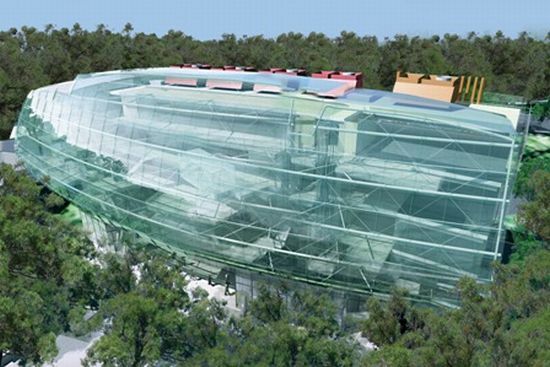 A key feature of the Sir Samuel Griffith Center will be visibility. The glass exterior and interior takes in more natural light and displays the built-in hydrogen storage technology. Partnering with Brisbane City Council, community access and outreach activities around reduction of greenhouse gases result in increased involvement and literacy on sustainable practices for both students and the public. Application of cutting-edge technology on the project has been made possible through government funding and participation of a diverse array of organisations. Out of the total AUD $33 million cost, the Australian Commonwealth Government, Sustainability Round, a part of the Education and Investment Fund, provides $21 million. The project has also received funds from the Queensland State Government, leading engineering and energy business players and academic organisations including the Griffith University research team. Energy generated from fossil fuels, which is destabilising our climate, is at the centre of today’s economy. But in this system, the end users of energy have lost their connection with nature. On the other hand, energy produced and consumed locally can bring communities and the energy grid together and foster a closer-knit relationship to nature. Underpinning renewable energy and renewable hydrogen through buildings like the Sir Samuel Griffith Centre is a common value: sharing. “We want people to copy and develop, we want that cycle to continue on and on, and we rapidly want to be considered old-fashioned because the field has continued to develop,” says Pankhurst. Griffith University shares this value as a part of a new ‘Energy Commons’ that will define a new energy civilization. Like the Creative Commons, movement before it, renewable hydrogen will allow people to share technology and stimulate their imagination in an open source environment. Renewable hydrogen: key to a new civilization by Rina Ariizumi is licensed under a Creative Commons Attribution-NoDerivs 3.0 Unported License. After studying Business Management and Development Economics at the International Christian University in Tokyo, Rina is exploring the fields of water and energy. As part of the Renewable Hydrogen Network (RH2) team, an international NGO, she translates, researches and writes to further spread the good message about hydrogen technology.